Thanksgiving is right around the corner. In a couple days, your extended family will descend upon your home – or you’ll descend upon theirs – and the 2013 Holiday Season will officially be under way. As with any major holiday, it’s useful to take a step back and think about how Thanksgiving originated, as well as what this holiday is really all about. Of course we all know the story of the Pilgrims. The Thanksgiving holiday can be traced to a festival of thanksgiving that lasted several days in Plymouth, MA, in the year 1621. The Pilgrims, who had just moved to the country in 1620, had a good harvest and wanted to honor God for it. They had a habit of fasting as they were waiting for God to bless them, and feasting once the blessing materialized. Thanksgiving was the natural conclusion to a harvest marked by divine providence. The real meaning of the holiday is decidedly Christian. Thanksgiving is a day created to give thanks for all the blessings bestowed upon us over the past year. We aren’t meant to give thanks to just anyone, and we aren’t meant to just think about how thankful we are; we’re supposed to pray. We’re supposed to gather together with our loved ones and offer praise and give thanks to God for all the ways in which He has abundantly blessed us. The United States is now a largely secular nation, and most of our major holidays have lost all reference to God and Jesus Christ in favor of turkeys, Easter bunnies and Santa Claus. However, the United States was once a religious nation. President George Washington proclaimed the first nationwide Thanksgiving on October 3, 1789. The full text of the proclamation is really quite stunning, especially in contrast with modern Presidential speeches (full text available here: http://herit.ag/1crAzfu). President Washington stated that he gave the declaration because Congress had asked him “…to recommend to the people of the United States a day of public thanksgiving and prayer, to be observed by acknowledging with grateful hearts the many and signal favors of Almighty God.” The President and the entire government at the time knew that the young nation was enjoying incredible favor and prosperity, and that we had God to thank for it – publicly! 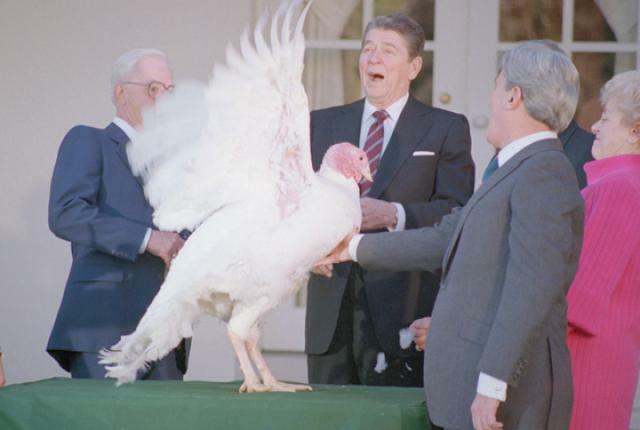 This Thanksgiving, as has become tradition, the current United States President will pardon a turkey, releasing it to live and roam freely in retirement for the rest of its life. My family and I will be thanking and praising God for everything He has done in our lives. We will also be praying that our nation once again makes the choice to collectively honor God for all the blessings He has poured out on us. Enjoy your turkey! In the Old Testament context, the people of Israel were instructed to rest on the Sabbath: a day designated to abstain from work and revel in everything God had done during the week (Gen 2:2, Ex 16:23). In the New Testament context, we have graduated from a single day of rest, once per week, to a lifestyle of rest. Because we have the Holy Spirit dwelling inside of us, and because the Son of God has come and hung on the Cross and died so we can be reunited with our Father, we should be resting spiritually at all times. Here enters the concept of feeling ‘well rested.’ Many times we get caught in the trap of thinking that rest is purely physical. The truth of the matter is that our body will take cues from our spiritual health; if we are well rested spiritually, then our bodies will follow suit. Feeling ‘well rested’ is not a function of how much sleep you get, but rather how much you depend on God. So, you may be wondering, ‘Is rest something I can control?’ The source of the rest we should feel as Christians is the result of God’s New Covenant with us; the cause (as differentiated from source) is our awareness that we should be resting. Rest, although always available, takes a conscious decision on our part. Someone or something will likely always try to command our attention and distract us from God and everything He has already done. If God has already made it clear that we are allowed to rest, why should we argue with Him? It is therefore our responsibility to announce to heaven, hell, and all those around us that we are not going to let any circumstance affect the spiritual rest that we have in Christ Jesus. Biblical rest is not passive, but rather active. Rest should be enjoyed with expectation of what God is going to do in light of everything He has already done. We must stay quiet and calm, but keep our minds and sprits engaged and our bodies ready with expectation for everything God is about to do. The very idea of rest implies that work has already been completed; in our case, the ‘work’ is Jesus Christ hanging and dying for us on the Cross. There is still physical (as differentiated from spiritual) work to be done, but it should be done in full view of the victory already won by Jesus Christ on the Cross. Any ‘work’ done with that victory in mind is, in fact, not really work at all. So how do we go about getting into rest? First comes trust. When we trust God completely and fully, we have nothing to fear. As the Psalmist states in Psalm 118:6, “The Lord is on my side; I will not fear. What can man do to me?” When we have nothing to fear, we have no reason to be anxious; and when anxiety has no part in us, we have rest (the absence of anxiety). Again, it is important to note that Biblical rest is not apathy, and it is not laziness. Biblical rest is knowing that “…all things work together for good to those who love God” (Romans 8:28). Action may be required on our part to go out and accomplish everything God has laid out for us to do, but trust in God enables us to fulfill our calling from a posture of rest. We can also be ‘refreshed’ by others. In 1 Cor 16:18, Paul explains that he has been ‘refreshed’ (allowed to rest) by his disciples. Paul knew that he could not be everywhere at once, and writing letters to all the church communities God had established through him could only do so much good. He needed trusted associates to help carry out God’s tasks, and could rest knowing that competent people were in charge of everything that he had left for them to do. We can encourage ourselves to ‘rest’ by surrounding ourselves with Christians who share the value we place on, and the passion with which we pursue, the things of God. We are not meant to live alone, and none of us is meant to accomplish the Great Commission as a solo act. It brings rest to know that Christian brothers and sisters are helping us to lead the charge. Closely on the heels of the revelation that we can be refreshed by others should follow the realization that it is our responsibility to be refreshing. Philemon was a man who knew how to do this well. Paul told Philemon in Phlm 1:7 that he had taken “…great joy and consolation in [Philemon’s] love, because the hearts of the saints have been refreshed by [Philemon].” If we can play an integral part in helping others to rest, we must endeavor to do just that. The Holy Spirit will give us even more thorough rest when we focus on loving, and giving rest to, others. So, have a great weekend! We hope you get some rest. In this scene, Jesus has just risen from the tomb. Mary Magdalene has run to tell Peter and John, which sends them running to examine if her claims of the risen Christ are true. There is much to be learned here from John’s response. First of all, here the Bible reinforces what wisdom already dictates: we should always examine the evidence of any supernatural claim. 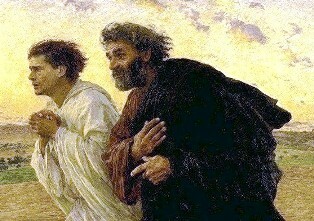 Peter and John both run to the tomb to test the story Mary has just told them. The key is this: they do it in faith; not in fear, and not in doubt. They examine the story because they hope it is true, not because their decision about Who Jesus Christ really is will hinge on what they find. Once John gets to the tomb, he does not need any more evidence. The verse above tells us that he (1) saw the evidence, and (2) immediately believed. John had yet to see the risen Christ for himself; yet he was able to examine what evidence he already had and make a faith decision at that moment. Each and every single one of us is in a similar situation. Unless you have been blessed with some miraculous encounter in which Jesus Christ Himself appeared to you in a vision or a dream, you have probably not seen Him face to face. Yet we are still required to make a decision as to what exactly we believe, based on the evidence we already have in front of us. This is not unfair; it is actually exactly what God asks us to do. We have a complete account of the life of Jesus Christ from four different Gospel writers. On top of that, millions of believers have left an account of all the awe-inspiring things Jesus has done in their own lives. God does not leave open to us the option of waiting until we see Him face to face to make a decision as to whether or not we believe in Him; He asks us to use what evidence we already have in front of us and decide, here and now, to believe in His Son Jesus Christ. There is no reward for waiting to believe in Christ until we see Him, whether after we die or at His second coming. By then it is too late. Infinite reward, however, is reserved for those who make that choice while they are alive. If you want to be blessed, you have to make the choice to believe in Jesus Christ; here and now, with whatever evidence you already have in front of you.